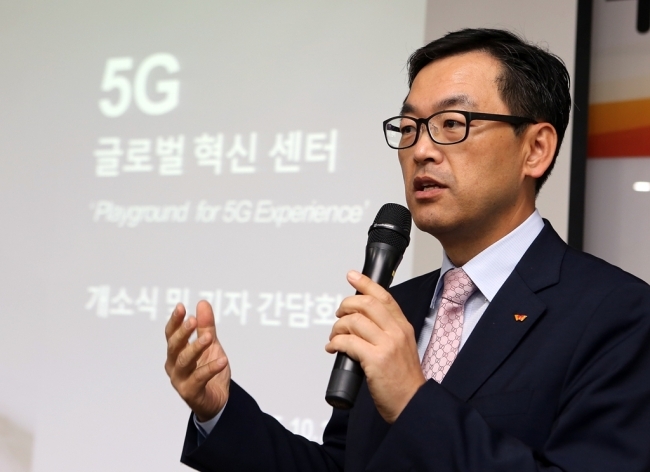 South Korea’s leading mobile carrier SK Telecom on Thursday opened an innovation center named the 5G Playground for developing and testing advanced network technologies with its partners. The 5G Playground, located in the wireless firm’s office in Bundang, Gyeonggi Province, features places where visitors can have a firsthand experience of virtual reality technology and test bed labs to conduct joint R&D projects with global IT firms including Samsung Electronics, Ericsson, Nokia, Intel and Rohde & Schwarz. 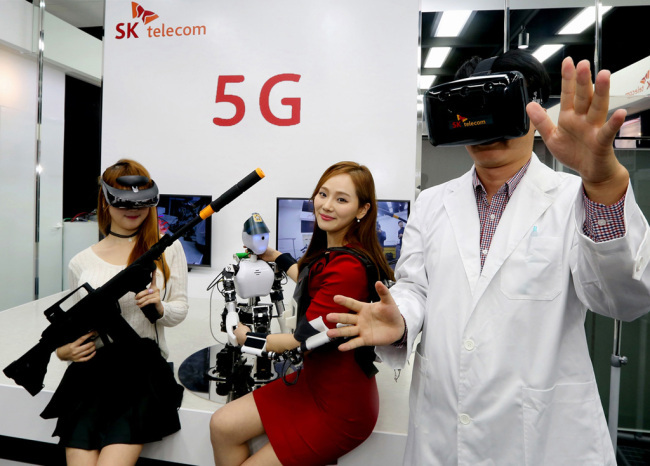 “SKT will spare no efforts to achieve the world’s first commercialization of the 5G network,” Choi Jin-sung, the company’s chief technology officer, told reporters during the R&D center’s opening ceremony. The firm is striving to gain the competitive edge over local carrier KT and global rivals to commercialize the 5G network for the first time in the world by 2020. To that end, SK Telecom has been joining hands with global ICT firms and network equipment manufacturers, unveiling state-of-the-art technologies. The latest results of the collaboration with its partners were a mobile network boasting a 19.1Gbs transmission speed and a network slicing technology, which the company explained divides a single physical network into multiple virtual networks to provide optimum support for different types of services. The 19.1Gbs network speed -- approximately 250 times faster than the 75Mbps LTE network launched in July 2011 -- is the world’s fastest network technology. The Korean mobile carrier worked together with Nokia for the network technology, which will allow users to download a 2GB movie file in less than one second. The Korean mobile network operator also introduced an ultrahigh-definition live broadcasting system with Sony. The company said it would enable high-quality TV content to be delivered over the air, which will be more efficient than traditional terrestrial live broadcasting systems that require satellites and optic cables. The T-AR, augmented reality technology, and a robot running on the 5G network are among technologies to be displayed at the innovation center.